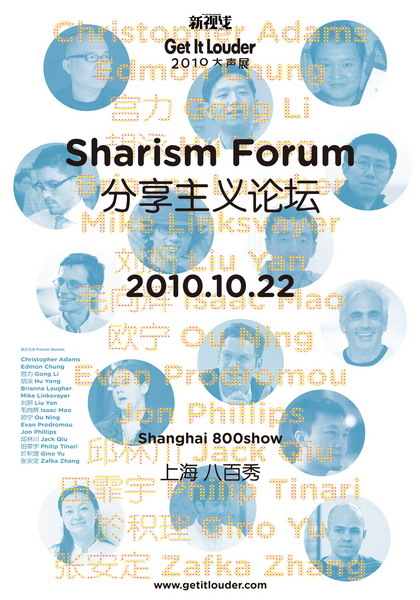 Well, this blog is slowly rumbling towards retirement, but I have a nice announcement for any readers in or near China :) In just a couple of weeks I will be speaking at a ‘Sharism’ forum in Shanghai as part of the Get It Louder festival. Pretty cool!! The other speakers look an awesome crowd. Clash of the Encyclopedias: Is Competition Good for Sharing? One of the benefits of the open web is that good ideas can flourish easily. In the Chinese speaking web, the idea of an online encyclopedia has been especially fruitful. With the Chinese Wikipedia enjoying its eighth birthday this month, it’s worth examining whether the fragmentation of efforts ultimately leads to a better product and bigger communities, or if the “us vs them” mentality is harmful to sharing. I don’t know any details yet about how much it will cost, or even where it will be specifically, but I’m sure those details will be surfacing any day now! I believe there will be simultaneous interpreting (a la Wikimania Buenos Aires) which will be great for the attendees. Mako is keynoting LCA (January, Wellington). WOOT. There was a conference in Portland recently called Open Source Bridge and it looks like it was really freaking cool. Really cool looking event in Canberra this week, courtesy of Senator Lundy — Public Sphere 2 – Government 2.0 Includes the creation of a Government 2.0 Taskforce which will provide some advice and even some funding! From the event itself, a wiki-based outcomes document is yet to surface. There’s an Open Education Conference being held in Canada during August 12-14. The speakers look pretty diverse, so if you’re interested in attending, check out how to apply for one of their travel scholarships. The 2009 OSDC CfP is closing on 30th June. So you’ve got about two weeks left to get your act together. This year the Open Source Developers’ Conference will be held in November in Brisbane. Secondly the 2010 LCA call for miniconf proposals is now open. This year, there will be 12 and they will all be one day long (previously half-day or two-day proposals were also accepted). I think this is for the best — one day is pretty much the right amount of time to fill. Last year I ran the Free as in Freedom miniconf which was successful in its own right. I am pondering whether or not to propose it again. At the moment I am leaning towards no, because it would be rather a lot of work, especially as I’m not particularly familiar with the New Zealand situation (linux.conf.au will be in Wellington). OTOH maybe that is a good opportunity to find out what’s going on in NZ. I’ve got about four weeks to give it some thought. Liam and I co-presented Wikimedia in copyright/copyright in Wikimedia, which is something of a grab-bag of topics that we thought might be of interest to legal academics and practitioners. I humbly submit that our experiences of “copyright in practice” and adjudication in the court of XfD-style “consensus” may be of interest to those mainly focused on the theory of how it all works. The feedback we received was very positive and I feel encouraged to expand one of my topics into a psuedo-academic essay. Graham Greenleaf, a co-director of AustLII, talked in the opening sessions on National and International Dimensions of the Public Domain. He raised the idea of creating a “peak body” to represent the public domain/public rights in copyright, perhaps by expanding the Australian Digital Alliance or by creating a new body. It seems a fitting conclusion to the Unlocking IP project — launching ideas for the next phase. Delia Browne of MCEETYA (a government education body) gave two talks, of which I saw the first: The Open Education Revolution: Sharing Nicely, which was a comprehensive overview of how the movement for open education resources (OERs) has evolved around the world and particularly in Australia. Anne Fitzgerald also gave multiple talks, the first being Re-use of Government Works. She talked about the notion of OA to PSI (open access to public sector information, i.e. government works) and how it has developed significantly in the last five years, and even more so in the last 12 months. Australia is a member of the OECD, which has made statements of support for OA to PSI (e.g. June 2008’s Seoul Declaration, in which members promised to create policies that “[m]ake public sector information and content, including scientific data, and works of cultural heritage more widely accessible in digital format.” But sadly unlike the EU, OECD promises are not binding. maximise the flow of government generated information,‭ ‬research,‭ ‬and content for the benefit of users‭ (‬including private sector resellers of information‭)‬. (My emphasis.) Well, we will see what DBCDE’s report says. There are a couple of good signs in recent times. One is the launch last week of the Government Information Licensing Framework website, which is more targeted at other government departments than the general public. A licensing framework is something that you might use to help you set up all your department’s information to be published under a permissive license by default. GILF was developed in Queensland and is, as their website proudly states, “leading the world in establishing a new approach to public sector information licensing.” Another is the Queensland government’s draft Right to Information Bill, which would complement the Freedom of Information Act. Where FoI is “pull” (you have to request the information to get it), RtI will apparently be “push”. It is not hard to remember criticisms made about FOI over the years, so if a “RtI” approach removes the ability of ministers to bin reports that make them look bad, that will be welcome news for all. …the exploitation of the opportunity has lagged, because of impediments to adoption, especially the lack of any positive incentive to self-deposit, and downright apathy. The outcomes to date are disappointing for proponents of OA and Unlocking IP. Only a small proportion of the literature is readily available, academics continue to be primarily dependent on the formal versions, academics continue to be uninformed and apathetic about self-deposit, and libraries continue to pay inflated prices to enable academics to gain access to the papers that they collectively wrote and that they collectively quality-assured. There are limited signs of the adoption process speeding up sufficiently to deliver significant results. OA and Unlocking IP in the area of journal articles are at serious risk of being still-born. Hm… what to do? I thought from what I learned at Arthur Sale’s open access presentation at LCA that institutional mandatory self-deposit policies were the answer (ie. the university requires that all academics put a copy of their journal articles into the university’s institutional repository). But according to Roger Clarke that would only increase the percentage of deposited articles to 30-50%. Perhaps the other 50% is the existing, unarchived works? Can academics somehow get extra cred for depositing their back archive? In the same session, James Dalziel spoke about Successes and Challenges for open IP business models. He went through a detailed “hypothetical” comparison between a “traditional IP” software company and an “open IP” one (ie open source). His conclusion was something like: although open IP businesses can make money, it’s an order of magnitude below the potential of traditional IP companies. Therefore, traditional IP companies cannot adapt to an open IP approach, and all that is left is WAR! I was one of the commentators on this session and I responded that since our (FLOSS) legal foundation is valid, all we can be attacked with is FUD (negative marketing), and even that doesn’t work forever. And calling it “war” is a strange thing, since it is a one-sided war, as we aren’t aiming to topple traditional IP companies — that will just be a completely unintentional side-effect. In summary, Unlocking IP was a fascinating crash course in where Australian copyright, open access and other ‘open’ movements might be going. Thank you to the Cyberspace Law Centre for hosting this event and provoking these conversations. This is a video that I took at the VITTA conference (Victorian IT Teachers Association). I was there giving a workshop about using Wikipedia in the classroom (session 1202), and Pia was there keynoting (1601 — the video above) and talking about OLPCs in Australia (1307)! She was also kind enough to let me license it CC-BY-SA. While there I also caught up with Donna Benjamin (1207) and Pru Mitchell (1203) — we three had the bad fortune to all be scheduled in the same time slot. Although with 20 simultaneous sessions, it might not be avoidable. By comparison with ACEC, this conference had a much better representation of open source software advocates amongst its speakers. The Linux Australia stand in the exhibition was getting excellent traffic throughout Monday. My workshop went well; the first time I’ve done anything like that, but the participants seemed engaged enough. 50 minutes is not really long enough for anything substantial, and I think a better ratio than 1:20 would be more helpful, but it’s a start! This is the only place I heard about this paper — identi.ca. It is often claimed that anyone can edit Wikipedia, and this is somewhat true for individual articles, but the overall structure is increasingly hard to change. In the paper Lars talks about his experiences implementing big changes on the Swedish Wikipedia. 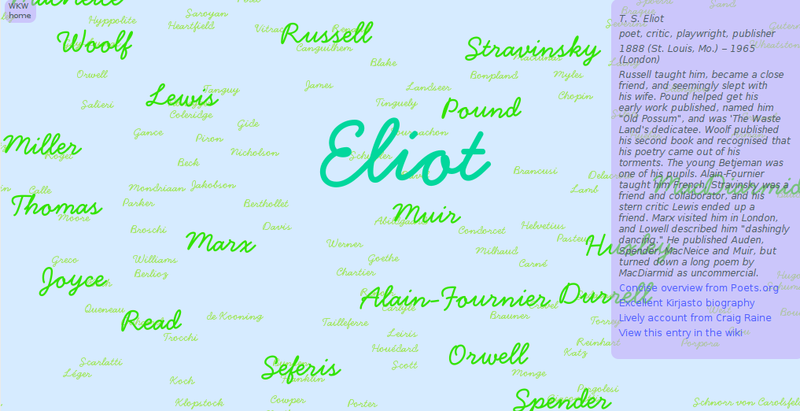 And they are really big — like implementing [[Category:Man]] or [[Category:Woman]] on all biography articles. If you wanted to do that on your local project how would you start? How would you rate your chances of success? What would you change about your normal approach to try and increase the odds of community acceptance? This paper is an interesting read for those interested in the culture of the Swedish Wikipedia, but more importantly it is a must-read for anyone interested in implementing project-wide changes, such as those relating to categories or templates for large numbers of articles. It’s a very valuable case study that I will no doubt look up should I want to return to wiki-reforming. :) Much thanks to Lars for writing it up and sharing it. Edited to add: I am a bit scared of the paper disappearing, so I have uploaded it locally. This “☍” “linky” symbol is something I picked up from Josh Bancroft to denote “linkblog” posts, ie. posts that are basically just sharing links with some small commentary. I think it is a neat convention. October 14, 2008 was the first ever Open Access Day. The open access movement is something I imagine most Wikimedians would support without hesitation. It is another essential piece in the puzzle of the world we are building with Wikipedia and her sisters. If you are curious but don’t know where to start, I can’t recommend highly enough the Open Access News blog by Peter Suber. It’s pretty high volume, so you might just want to read it with an eye for stories relating to your country. via Axel Bruns I found out that there are several sessions on wikis at the Association of Internet Researchers conference currently being held at the University of Copenhagen. The conference website has their programme wrapped up in a PDF, so I copied them out below. According to Axel the first two involved user studies, which would be interesting to read. I wonder if all these authors are subscribed to wiki-research-l?? This Slideshare bizzo is pretty neat. (But after you press play you probably don’t want to do anything else in your browser.) The audio synchronising tool is well designed — now what’s the offline equivalent? 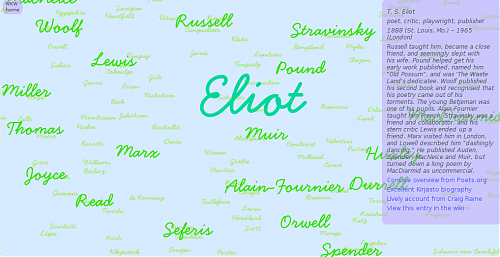 Whither free software in education? I just arrived back from the Australian Computers in Education Conference (ACEC). It’s actually still going, but as I’m not a teacher and hence hanging out at education conferences doesn’t constitute paid work for me, I decided to go home early. It was all a bit of an eye-opener for me. There was a huge hall filled with exhibitions mostly from commercial software companies, where all meals were held. I was rather taken aback at the idea that teachers might wander around and actually purchase software based on these stands. Reminded me of pharmaceutical companies marketing to doctors. For fun I spoke to the woman at the Encyclopedia Britannica stand. I didn’t even realise they had much Australian presence. And I didn’t even realise the main thing they were pushing these days was website subscriptions (as opposed to books and CD-ROMs!). They offer basically three versions of each article, written for different ages/reading comprehension skills. She also told me a couple of scare stories, like what if chill-uns look for pictures of the murray darling (“Imagine what they get, with the word ‘darling’!” — actually they get exactly what they’re looking for), and a surely made-up story about her 10 year old nephew looking for pictures of soldiers by typing in “pictures of privates”. There was exactly one talk relating to open source software (many others by commercial software providers). At first I was so excited to see another FLOSS advocate (despite the somewhat troubling use of the word “freeware” in the abstract.) So I went to it… and the speaker proclaimed that “Google” was “open source”. I don’t even know what that is supposed to mean, most Google products don’t even supply source, let alone under an open source license. So that was kind of a shocker. What a shame. There was supposed to be an OLPC talk but that was cancelled. I spoke to a university lecturer there I had met before, and I said how I found the lauding of web-based technologies a little worrying given the concerns about network lock-in, and that as I saw it there was little difference between being locked in to a software product/format vs a website. (It’s all about the API — can you get your data back out if you need to? If not, tread warily!) He mentioned how a large company had come to his campus offering to take care of his university’s infrastructure (email, course management etc), and his university had just laughed at them because it would be ludicrous to give up that control to a commercial company for little to no benefit. And seemingly the large company was taken aback because elsewhere they had had a good reception. Seriously. What primary school and high school students learn to use is likely to be highly influential. Many of them may never go software-exploring beyond what they become familiar with at school. As I remember my grade 12 software development and design teacher putting it, why the hell should the state education department pay Microsoft (or anyone else) for the “privilege” of using their software or services? Why the hell shouldn’t they be paying the education department for the opportunity to influence this captive audience of millions of students? OK, so that’s a naive dream, but I learnt more about free software in education at a Software Freedom Day event with an audience numbering tens, than I did at a gigantic biennial national computers-in-education conference. So we freedom lovers can’t afford lobby groups and trade show exhibition stalls; I reckon we could have at least put together a FLOSS talk from someone who actually knows what the term means. MediaWiki derives its structure from links, templates and categories. You don’t need to do very much to develop something quite powerful. This site called culturalcartography.net only uses links, for example. They skinned up their MediaWiki and used it to develop the bulk of the site’s content, then wrote their own SVG interface that calls their MediaWiki API and presents the link web in a dynamic and interesting way. I found this out from a paper called Building an SVG interface to MediaWiki (full paper) at SVG Open, which is currently on in Nuremberg. 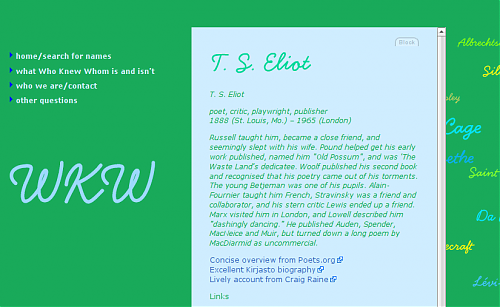 The edit box: see, it’s really MediaWiki underneath! 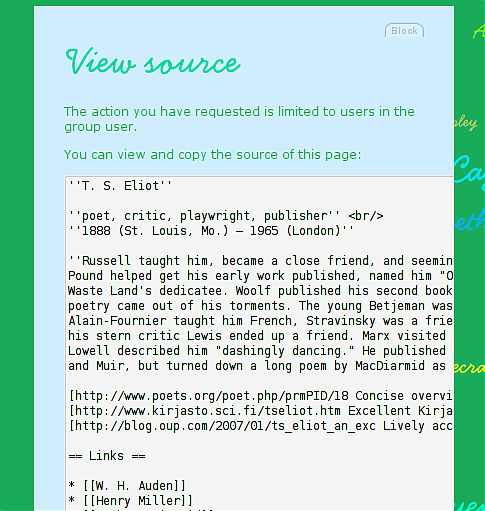 The custom-built SVG interface view that calls on the MediaWiki page of the same name, showing the link web between this page and others in the same wiki. Free Culture Conference (”Get your FreeCon”) would be a meeting of specific projects to hash out interrelationships and collective trajectories for the coming year. … The goal of the event would be to produce actual statements showing resolutions with implementation to back them up, and to announce the next 5-10 free culture priorities for the year. Check out also the Free Software/Free Culture Collaboration presentation given by Mike Linksvayer (Creative Commons VP) to LinuxWorld expo. The week before last I zipped up to Brisbane to attend the Building an Australasian Commons conference hosted by Creative Commons Australia. There were presentations from government, commercial projects, public broadcaster, educators and musicians. (The “music” roundtable was most amusing for an apparent stoush between the APRA guy and, well, everyone else.) Overall, I was just so impressed that there was so much going on that I’d never heard about before. Not like I hear about everything, but my ears tend to perk up at “Creative Commons”. That there was so much I hadn’t heard about seems a sign that CC is gaining some serious momentum in Australia. They deserve to, I might add. Throughout the day I reflected on the similarities and differences between the Creative Commons movement and the Wikimedia movement. Both are non-profits with broadly similar goals, and were founded around a similar time (2001ish). Both now have US-based “parents” with region-based “chapters” (WMF) or “jurisdictions” (CC). Where CC began life with some serious clout (and cash) behind it, Wikipedia was built on nothing much more than enthusiasm. Those divergent beginnings carry through to today, where WMF has only very recently “professionalised” and the chapters are still largely grassroots affairs; on the other hand CC jurisdictions tend to be staffed by paid professionals and housed in universities. This is not too surprising for CC, as their major task is “porting” the licenses to local laws. Their role is more of an enabling one, compared to Wikimedia which still feels itself to be a very hands-on, creating one. CC has jurisdictions so the licenses are adapted to local law. Wikimedia has chapters so its local members may belong. In this view there is no need for chapters to be “professionalised”. Nonetheless, what can we learn from how CC conducts itself? I can’t speak for the other jurisdictions, but the Australian one is damn impressive. They do an incredible amount of gently-gently lobbying for the adoption of free content licenses and open access policies in a general sense, without only pushing their own licenses. They educate government, cultural and educational institutions about what CC is and how to use it. The Australian clinic started the Case studies project, which is a brilliant way of showcasing their successes and “normalising” the use of CC for organisations who are hesitant to jump on board. With this kind of index, they can easily find a similar-enough group that has already made the leap and make an assessment of how successful it was for them. The lessons for Wikimedia from here are pretty obvious. Wikimedians could do a lot worse than evangelise the use of wikis in a generic manner just as CC evangelises the use of free licenses. Educating people about how wikis work in a generic way, their social norms and technical features, etc, helps to get people used to the idea in general. They will then be more predisposed to accept the use of Wikimedia wikis in particular. At the moment the only wiki cheerleader I really see is Stewart Mader, and he does an excellent job, but he is rather more focused on intranet-style wikis than generic community-content-building wikis. Wikimedians may be loath to say, “Wikis are great, and yeah, feel free to use whichever wiki engine and whichever organisation host you like”. But I think we will be better off in the long run with larger numbers of people understanding wikis themselves, rather than smaller numbers understanding specifically our wikis. The second lesson is: case study collection. Great idea. We totally need one. That’s a duh-case. I was also thinking about the consequences of jurisdiction that begins life in a university department vs a chapter that begins life in Wikimedians’ cafes and talk pages. It seems to me CC(au) is much better prepared to deal with institutional involvement. Maybe it is just practice. By comparison, Wikimedians tend to be very focused on individuals’ contributions. They probably look very messy and “mob-rule”. That’s one way of looking at it that’s true, but I think there are others too, that we might do well to emphasise to different audiences. When Wikimedia Australia is struggling a little to shape dozens of enthusiastic volunteers into something acceptable to Consumer Affairs, Creative Commons Australia is thriving with a handful of paid staff. If I sound a bit jealous of the perks of “officialness”, the office and giant printer, well, yeah, I am. Only a tiny bit though. I love that Wikimedia is filled with chemists and students and office workers and nurses, from 15 to 65(+), who have the boldness to believe that everyone can participate in the writing of the history books. We can observe what works for others and borrow all their best ideas (we all believe in a sharing culture, right ;)). We’re slow to get going, but hey, we’re in it for the long haul. Adam Hyde was interviewed on Radio New Zealand National about FLOSS Manuals (after some diversion about radio signals at the start). Kiwis have nice radio accents. :) I’m not sure what format “asx” is, but if you download this file, VLC can play it. The idea of a “New York City Free Culture Alliance” was floated on foundation-l, which sounds pretty awesome to me. I hope it goes ahead. Sydney has been selected to host FOSS4G 2009 (that’s “free & open source software for geospatial”). It will be “the seventh ‘formal’ gathering of the open source geospatial community and is expected to focus on the increasing importance of FOSS4G in the public and private enterprise”. Freebase, which I have mentioned previously, have announced the release of WEX (‘Freebase Wikipedia Extraction’). “The wiki markup for each article is transformed into machine-readable XML, and common relational features such as templates, infoboxes, categories, article sections, and redirects are extracted in tabular form. Freebase WEX is provided as a set of database tables in TSV format for PostgreSQL, along with tables providing mappings between Wikipedia articles and Freebase topics, and corresponding Freebase Types.” It’s not clear what date is on the Wikipedia dump they’ve used. But it could be a fun toy. A Wikipedia Selection for schools DVD was produced for 2007, now suggestions are sought for additions or updates for the 2008 edition. Creative Commons now mark their free licenses with a seal designating them as ‘Approved for Free Cultural Works'. Although I find the seal itself a bit naff it’s a good concept. 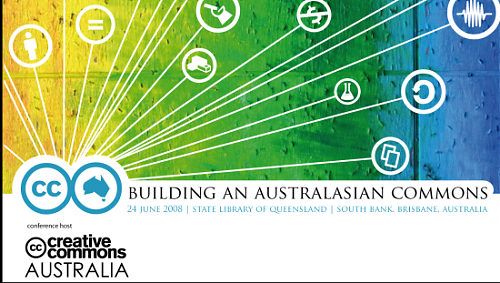 Apparently CCau is holding an event called building an australiasian commons in late June, Brisbane. Might be worth the trek, there look to be some interesting things on the schedule including lots of case studies and reports from overseas. Don’t forget, I’m still maintaining the free culture events calendar, which you can subscribe to as a Google calendar or an event-based feed. If you know of any events which belong on there, please drop me a line and let me know. 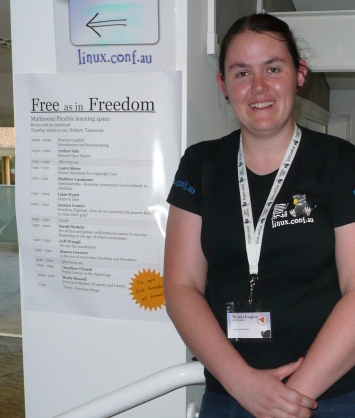 Woot, today was the LinuxChix miniconf of linux.conf.au (LCA), one of the three big free software related conferences held around the world each year. I spoke on Wikipedia (duh), giving a kind of second-level introduction aimed at cutting through bureaucracy by explaining what was important and what could wait until later. I always used to think I had to read all the relevant policies and guidelines before I did anything. So I would spend hours pouring over MoS pages and the like before even writing a paragraph. Later I got much more relaxed about it and figured, correctly, that someone else would clean it up to conform to MoS if it really bothered them that much (and evidently it does, or else it’s easier to make automated changes that relate to formatting than actual content). In a nice surprise I saw Nick Jenkins, who I didn’t realise was attending LCA. He took notes on my speech and they’re probably better than mine so I recommend reading those. :) You can also read my slides from Wikimedia Commons. There was lots of video going on and I will link it up whenever I see it published. Stormy Peters gave a great talk about community managers. As I listened to her talk I realised… I am a community manager. All the things she mentioned are exactly the things I do in Wikimedia, mostly for Wikimedia Commons. How interesting. Last night I decided there were enough free culture-ish events happening next year that it would be worth creating a calendar for them. So now there is events. I pondered for a while the Textpattern plugins for events and calendars, but they were overly complex. So I decided to make a Google Calendar and just embed it. So the full list is here: http://feeds.feedburner.com/freeculturecalendar. And you can add the calendar to your Google calendar: Let me know if you spot anything missing I should include. The relative ease in developing online content with a community of ‘at a distance’ presents wiki as a model tool for tele-collaborative production. Wiki is yet another example of how technologies are changing the ways in which creative knowledge production is being transformed by enabling collaboration between diverse individuals. In this theme, we seek to initiate discussion, deliberation and development in collaborative creation using new technologies. How have new and old technologies contributed to the development of collaborative making? What are some of the issues raised by collaborative creation; for example, authorship, artistic responsibility, claims to intellectual property, conflicts and confluences of disciplinary knowledge and practices, etc. What are the spaces of such collaborative work – what are the transitional spaces between the artists’ studios and scientific labs? We invite artistic and academic work that addresses and/or exemplifies the problems and possibilities of collaborative creative work that are enabled by technologies. Works that are created by collaborations between diverse and geographically diverse communities are especially encouraged. Given that Singapore is just 7.5 hours away hm, that seems awfully long for just three hours time difference), it seems a shame for me to not even try to submit something. So I will have a think about it. Collaboration is something the free culture movement has down pat, after all, and Wikimedia especially so. Perhaps a look at the collaborative nature of the FPC process might be of interest. It seems like something Joi might attend. Would be cool if there were some other Wikimedians around! Abstract submissions close November 14th. CaFeConf 2007 is just finished, and WMF had no less than Wikimedia Argentina’s Patricio Lorente representing. CaFeConf 2007 is the 6th conference of open/free software and GNU/Linux and is held each year in Buenos Aires (at least, as far as I can tell from Google’s translation of the Spanish Wikipedia article – any volunteers for translating it to English? :)). Patricio’s slides are licensed under the GFDL and there is also video although the sound quality in particular is not too great. I believe his talk about the problems wiki communities face as they grow in size, but since I don’t understand Spanish I can’t tell you the nuances of it. contenido nuevo en su equipaje. New content in his luggage. I did an interview this morning on a friendly morning talk show, your basic “what is Wikipedia, how do you know it’s reliable, WikiScanner/Captain Smirk" deal. At one point they commented on my job title (computational linguist) and said something like, “I suppose that helps with all the wiki stuff.” And I remembered no… Wikipedia is not just for the geeks and the technically literate. Two million articles, big deal. If we really want to accurately represent “the sum of all human knowledge” we need input from all humans, not just the ones who understands 1s and 0s. I mentioned farming and parenting as two fields that we need more input on. I have a farmer friend and I know he knows a ton of things that are poorly represented in Wikipedia, if at all. Farmers are generally out farming, rather than watching morning TV with a laptop in hand, no surprise there. But I guess in the future there will be more conflict between “knowledge” and “stuff without sources”. The ever-increasing crackdown on the need for citations and reliable sources should make the showdown necessary. Because it is no secret that science and the arts and academia have not studied everything that makes up people’s lives, even in a western country like Australia. Do I sound anti-sources? I’m not. For a good many topics a reliable sources crackdown is the only way to go. But when otherwise uncontroversial, useful articles get deleted as “non-notable” because there are no possible sources because academia hasn’t come to it yet, I think we are not applying the fifth pillar quite often enough. If there is no conflict, it could only mean the sources brigade had a victory and the keepers of “unacademic knowledge” left early, defeated. I would consider that a loss. Bits & bobs/is shared vision more important than a specific license? WikiSym finished today. I would have loved to have gone; I hope more reports from there filter through various blogs. She’s Geeky is also on and it’s another event I would have loved to attended, but sadly wrong hemipshere, wrong continent. Luckily Liz Henry is attending and blogging (and also doing a presentation on wikis I believe, pity there’s not more wikichix there). Wikimedia Sweden is almost really official. Congratulations folks! The fact that the first, great draft of the ‘Cape Town Open Education Declaration’ has already been circulated, the fact that its impact was not ‘watered down’ by this “dispute” [about NC or not NC], and the fact that this group has recognised that standing together in our shared vision of what education should look like in the future is more important than the (important but less important) differences of opinion about copyright licences. This is a conclusion that I had long ago but didn’t know how to express: this movement has very little to do with copyright and everything to do with people; it has very little to do with being free to share content and everything to do with sharing perspectives and fellowship. Hmmm. I don’t know how to feel about this. I would like to be convinced on this point. But currently each time I see some cool new project launched under CC-BY-NC my heart sinks a little. I don’t see a way around the conclusion that the Creative Commons NC clause especially creates a divide among content that maybe could have been avoided. If CC educated people more about how damaging a NC clause can be. If CC helped let individuals see their place in a long and evolved tradition of free culture. Maybe if CC didn’t offer it at all in the first place…. And when I read about someone who wants to release a ‘free software library’ under BY-ND terms I really think, someone missed the boat here… how did we let that happen?